About: "These guys make some of the most beautiful drift on the planet. The companion album to ‘Endless Clouds’… More gloriously free psych stumble and rock flutter that falls about the ears like gentle shimmering sand." 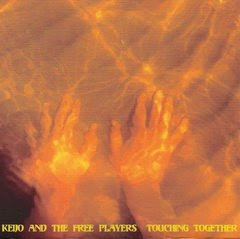 "You've got to be careful when you call a record 'Touching Together', you never know when you might end up in front of court and it might get used against you as evidence, so Keijo had better be squeaky clean. Well he's certainly squeaky, being one of the originators of the psychedelic folk sound of Finland he knows how to make squealing abstract noises into gorgeous passages of endearing oddness and this album is yet more reason to take the man seriously. Again he's accompanied by his band of trusty followers the Free Players who assist our protagonist on his journey through quite unashamedly beautiful free form folk music. If you've heard the man's work on Last Visible Dog or Digitalis you'll probably know to expect the most smudged and haunted sounds this side of the Baltic, but 'Touching Together' I must say is one of my favourite collections of his work together to date. The opening track 'Where Do You Go' combines some natty free jazz percussion with a quite phenomenally trippy synthesizer line straight out of the Religious Knives songbook, and since I'm all over those guys right now I can hardly resist falling into a trance when I listen to this record. Elsewhere we get the skronking free rock/blues of 'What Was Left' and the record closes on the slow building freak-out of the title track 'Touching Together'. Awesome stuff."